This book is a welcome introduction to the work of a renowned ethnologist, who has been extremely important in preserving Maori traditional music, largely through fieldwork carried out from 1958 till the 1979. Although Mervyn McLean has written or collaborated on a number of scholarly volumes over the years, notably Traditional Songs of the Maori (co-authored by Margaret Orbell) and Weavers of Song, this book largely dispenses with song texts and analysis. Instead it relates McLean's experiences as a collector, his difficulties and successes and the challenges of being a pioneering academic in this field. Maori music comes in many forms - traditional, 'action song', popular and various more modern formats, bearing the various influences of classical and popular music. Probably the best known traditional Maori song is the haka 'Ka mate', which is used by New Zealand's 'All Blacks' rugby team before international test matches (also included in its traditional form on the To Tatau Waka CD). Most of the other Maori songs readers may possibly have heard of - Pokarekare Ana, Hoki Mai, Po Atarau/Now is the Hour - belong to a period of music-making from the late 19th century onwards, when western-style melody, harmony, and instrumentation had all had a profound influence. Traditional Maori music however is rather different in its sound, vocal techniques and social meaning. This music is closely tied to traditional Maori customs and life and particular song genres accompany particular events, rituals, processes or festivals - waiata tangi are laments associated with funerals; hari kai are food-bearing songs; waiata tohutohu are songs of instruction. Each genre has its own musical characteristics, though certain practices or beliefs (such as a loose prohibition on pausing during a song) cover all forms. There are also instrumental musical genres, some of which are largely lost (drumming), and others which were recorded from surviving practitioners, one in particular by McLean, that of a small flute-like instrument the nguru. Readers may be wondering what this music sounds like. Obviously, all the music is sung in Maori. Certain genres (karakia) are typified by a highly structured rhythmic feel, with little melodic variation - essentially chanting. Other types of song, where one singer leads a group, e.g. waiata tangi, contain more melody, which combined with a unique harmonisation (often extremely high and low parallel harmonies) create a powerful and hypnotic effect. In these cases, singers overlap their breathing cycle, so that the song will not hesitate when one singer takes a breath. Coupled with a pronounced vibrato or even wavering (semi-improvisation around notes) the different voices weave together continuously, some joining in, others dropping out then rejoining. It's not quite like anything else, though certain other Pacific traditional music is related. Early European visitors to these shores are reported to have found this music somewhat dreary, monotonal and mournful. Well, while the music is certainly not dreary, it is serious listening. I also think mournfulness is probably the appropriate emotional effect of some songs, though of course not all. There is a particularly timeless quality to this sound - it is music that is in deep sympathy with traditional Maori life, and that has resolved into forms appropriate to the work-cycle and spiritual and social systems of Maori people, and also the landscape of New Zealand. This is not to say that the songs are all equally profound in their subject-matter. One genre that McLean 'discovered' was the pao, which is basically a short ditty. The texts of Maori traditional songs began to be collected by Europeans in the mid-19th century. Interestingly, one of the first published collections (1851) was by Sir George Grey, two times governor of New Zealand and the nemesis of various Maori tribes. Sound recording began in the 1910s, with a number of wax cylinder recordings being made under government sponsorship. Further work was carried out in the 1950s by the Maori Purposes Fund Board and also Radio New Zealand. Mervyn McLean comes into the picture in the late 1950s, when he was a graduate student in music at Otago University, Dunedin. Encouraged by lecturers and professors he arranged through contacts to make a field recording expedition for a few months in mid-1958. Accompanied by Arapeta 'Peter' Awatere, he drove the backroads of the Rotorua-Bay of Plenty region in his Hillman 80, recording various singers and groups. As with previous recordings, part of the impetus for this expedition was the fear by many, both Maori and Pakeha, that although song-texts existed in their thousands, the song tunes were in danger of being forever lost as older singers passed away. This has been a defining motive in McLean's subsequent work - to preserve a unique form of music from oblivion. His later field expeditions (mostly conducted between 1962 and 1964), were beset by certain difficulties and frustrations - personal discomforts, technical problems, false leads, tribal disagreements, supernatural sanctions on performance, fear by singers of commercialisation etc. - but one senses that his own sense of mission overrode these setbacks. McLean tells this story in a plainly written style, detailing each recording session and its particular anecdote. At first it seemed a little repetitive, but as I read on, more complicated issues were raised about the collecting of traditional music, which Musical Traditions readers will be familiar with - How does one justify the process to oneself and the singers? Is there an element of exploitation for personal gain or prestige? Is it right for someone from outside the culture or tribe to collect their music? Should the recordings be restricted in any way for later researchers? Should they ever be released to the public in the form of CDs? Throughout To Tatau Waka, McLean ponders these ethical questions. On the question of actively soliciting singers: “My role as I saw it was no more than to provide an opportunity [for the singer to record] and, if it wasn't taken up, my responsibility ended.” In other words, the singers who recorded had weighed the process and had found their own justifications. In a sense, they controlled the recording. Other aspects, like the question of personal gain, he admits to never having entirely resolved. Collecting from Maori, McLean encountered many instances of complicated tribal protocol, often leading to an extensive series of meetings to decide whether songs would be sung for him. He considers that as a pakeha 'outsider' he was ultimately in a unique position to preserve the music - that his 'neutrality', in tribal terms, counted in his favour. Needless to say, some tribal groups were completely unwilling to record. In the end, those who did, McLean speculates, saw him essentially as a trustworthy preservationist, whose increasing reputation began to precede him. Eventually some groups who had initially refused to record, later contacted him in a last-ditch attempt to record elderly singers. In all McLean collected some 1300 songs from 253 leaders and singers and these later formed the basis of the Archive of Maori and Pacific Music (University of Auckland). 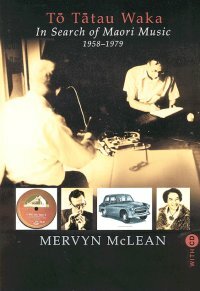 Another of McLean's achievements was the creation of this Archive in 1970, to which he and others have added field recordings made in New Zealand and the Pacific region. It now holds many thousands of recordings. McLean himself went on to became a renowned expert in this field and his transcriptions and analysis were vital in working out the structural underpinnings of Maori music. In To Tatau Waka he covers some of this academic work, though not in great detail. (For those interested in the finer points of this subject, Traditional Songs of the Maori has just been re-issued. Originally published in 1975, it now includes two CDs of field recordings. The book Maori Music, Mervyn McLean, 1996, gives more of the historical context). In passing, it should be mentioned that traditional Maori music is very much a living tradition - and McLean has certainly assisted with this by providing an accessible archive for Maori to refer to. There has also recently been a revival of interest in traditional instruments, used in both the accustomed ways and in contemporary music formats. Some of the more interesting anecdotes throughout To Tatau Waka are about academic life, which has its share of protocols, rivalries and ambitious personalities. McLean's tale of how the wax-cylinder recordings collection in the Alexander Turnbull Library were kept 'secret', so a particular writer could have exclusive access, is a particularly negative instance. Other academics were supportive of McLean's ideas however, especially in the setting-up of the Archive. In the final analysis, I would heartily recommend To Tatau Waka, and not just to those with a special interest in Pacific traditional music. McLean's open and modest approach to his work and the occasional dry wit of his writing, make for an unassuming and informative read. It certainly made me think harder about the complicated dynamics and ethics of collecting. Though not being particularly informal, there are various intriguing, humorous and tragic stories to be had along the way - recording a singer whose house was only accessible by beach at low tide, a recording session of Ringatu religious songs being interrupted by a group of touring American evangelists and the later imprisonment for murder of his early collaborator Peter Awatere. There are also many black-and-white photographs throughout the book. The tracks are presented in chronological order and follow the book narrative closely (with indications in the text when a CD track is mentioned), and include all of the major singers. It also includes one track of the nguru being played. The sound quality is very good, with the usual 'actuality' of field recordings - passing cars, coughing etc. None of this is in any way distracting. It features 35 tracks and is approximately 65 minutes in duration. The book can be obtained from bookshops in New Zealand or from websites such as www.maorimusic.com or www.realgroovy.co.nz, where it retails for NZ$39.95. It is also available from Amazon.